This week market showed mixed responses with negative tendency where China being the only origin reporting an increase. In local market, black pepper India was traded stable at an average of USD 4,773 per Mt. Though, Indian Rupee weakened towards US Dollar, pepper price in India stable due to the slight increase in local currency which averaged at INR 331 per Kg. Following India, Indonesia also traded its Lampung black pepper and Muntok white pepper stable with an average of USD 2,120 per Mt and USD 3,568 per Mt respectively. Malaysia black and white pepper was traded at 1% deficit as compared with the previous week, averaging at USD 2,281 per Mt and USD 3,838 per Mt respectively. The drop in Malaysian pepper prices could be contributed to the weakening of Malaysian Ringgit towards US Dollar as the pepper price in local currency remained the same at an average of MYR 9,365 per Mt for black pepper and MYR 15,756 per Mt for White pepper. Viet Nam black pepper was reported to record a 1% deficit when compared with the previous week and was traded at an average of USD 1,841 per Mt whilst Viet Nam white pepper was traded 6% less than the previous week, averaging at USD 2,856 per Mt. Viet Nam's current harvest season continued to put pressure on the price whilst Vietnam Dong also reported to weaken against US Dollar. Sri Lanka black pepper was reported to have experienced 1% deficit when compared to the previous week whilst China white pepper became the only origin to have recorded an increase by 2% to an average of USD 4,692 per Mt. In the international market, the same trend occurred with only China origin recorded an increase. India black pepper was traded stable at an average of USD 5,062 per Mt. FOB prices for Lampung black pepper and Muntok white pepper was also reported stable. Malaysian's FOB prices for black and white pepper were reported to have experienced a slight 1% deficit as compared to the previous week. FOB prices for Viet Nam black pepper 500 g/l, 550 g/l and white pepper were reported to have experienced the same 1% deficit as compared with the previous week and averaging at USD 2,150 per Mt, USD 2,250 per Mt and USD 3,450 per Mt respectively. China white pepper was traded internationally with a 2% increase when compared with the previous week. US market was reported quiet and stable. Sri Lanka, also known as Ceylon, is one of pepper producing countries with estimate production of pepper around 18,600 Mt for 2018. Though limited, Sri Lanka contributes to small share of global export with their distinctive black pepper. 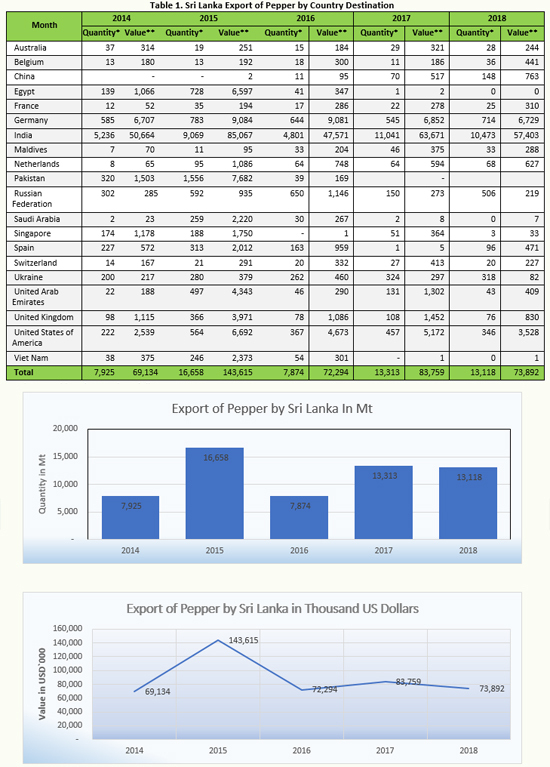 In the past five (05) years pepper export by Sri Lanka had fluctuated with an increasing trend both for the quantity as well as its value. India had become the top destination of Sri Lankan pepper in the past 5 years which could be contributed to the Free trade agreement between the two countries. In 2014, Sri Lanka was reported to have exported a total of 7,925 Mt pepper which banked a total of USD 69.1 Million. Resulting an average price of the total pepper exported by Sri Lanka at USD 8,724 per Mt. Sri Lanka was reported to have exported a total of 5,236 Mt of pepper to India alone in 2014, making India the number one destination of pepper exported by Sri Lanka followed by Germany with 595 Mt. 2015, pepper export by Sri Lanka spiked significantly to 16,658 Mt recording a 110% increase when compared to the previous year. For the same year Sri Lanka also recorded the highest income from pepper export in the past 5 years with a total of USD 143.6 Million or a 108% increase when compared with the income of pepper export in the previous year. The average price of the total pepper exported by Sri Lanka for 2015 was reported at USD 8,621 per Mt. India remained to be the top pepper export destination by Sri Lanka with a total of 9,069 Mt followed by Pakistan with 1,503 Mt. Sri Lanka pepper export decreased by 53% in 2016 to 7,874 Mt when compared with 2015. Sri Lanka further lost 50% of its income from pepper import in the same year. Banking only USD 72.2 Million on its pepper export revenue. Sri Lanka recorded an average price of the total pepper export at USD 9,181 per Mt. Though it significantly dropped, India continued to be the top pepper export destination by Sri Lanka with 4,801 Mt followed with Russian Federation. In 2017 Sri Lankan export of pepper spiked by 69% to 13,313 Mt as compared to the previous year. Pepper export revenue of Sri Lanka in 2017 was also reported to have recorded an increase by 16%, amounting at USD 83.7 Million. Thus, recording an average price of the total pepper exported by Sri Lanka at USD 6,292 per Mt. India's total pepper imported from Sri Lanka spiked to 11,041 M whilst Germany following with 545 Mt. 2018 saw Sri Lanka exported 13,118 Mt of pepper which was 195 Mt less than the previous year. The slight drop in the quantity of the pepper export was followed by an even greater loss of 12% in terms of pepper export revenue of Sri Lanka which amounted to USD 73.8 Million. In 2018, saw the lowest average price of the total pepper exported by Sri Lanka in the past 5 years which only reached USD 5,633 per Mt. India was reported to have imported from Sri Lanka a total of 10,473 Mt pepper whilst Germany imported 714 Mt of pepper from Sri Lanka.